Our newest addition to the showroom is Armstrongs American Scrape. 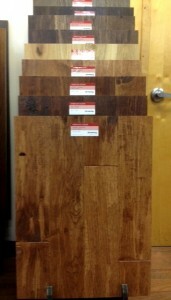 This line offers 20 different Oak and Hickory styles all in a vintage hand scraped 5″ wide board. Through 2013 Armstrong will donate a portion of the sales of this product towards Homes for Our Troops. But they don’t stop there- Armstrong also donates the flooring for 30-35 homes nationally.